My husband has three sisters. They’re all adults now, and they live in different places throughout the state. The closest one is about an hour away from us, and the farthest is four hours away. Though they’re years apart all of their birthdays, including their dad’s and my husband’s are between August 30th and the last week of September. My niece was born somewhere in that date range too. That’s 6 birthdays in a month. This is way too many different events to celebrate them separately, so we all get together for one day or weekend instead. It works out well, but it means carrying a whole lot of presents there and back. On our way there, we have bags full of stuff for huge numbers of people who we’re going to celebrate with. My husband tends to buy something huge and ridiculous for his dad (like a mounted Spartan helmet). We often get clothing, jewelry or minor electronics for his sisters, and I usually buy our niece all sorts of different clothing that basically has to be toted in its own wardrobe. It’s just so much stuff! I would love to have one large bag that can hold all of this which is why I’ve decided to include the Samsonite Tote-a-ton 33 Inch Duffle Luggage which, quite frankly, is huge! In fact, it can hold up to 50lbs! The rectangular shape offers plenty of extra room so you can fill every corner. The Tote-a-ton 33-Inch Duffle is an alternative to flatter rolling bags. Bigger, squarer items can fit in it while still having plenty of room to keep other things. The reason I like it is because I don’t have to worry as much about expensive items shifting around like I would in a rolling bag . Rollers go from upright, to tilt, to flat depending on the use, and that’s plenty of “positioning” for presents to move from one place to another. Tote-A-Ton is good for more than travel. In fact, you could use it to keep things stored away. It’s just as effective as one of those large plastic bins, but it’s less likely to crack like they do. The Nylon is soft and safe, and can repel small amounts of liquid and other unwanted substances from your bag. The Nylon allows you to just wipe it down with a damp cloth if it gets a little messy. This is the perfect present transporting bag because it opens from one end to the other. You don’t have to worry about maneuvering bulky or oddly shaped items into strange corners that the bag doesn’t open wide enough for. There is no such thing as wasted space in this bag if you have enough stuff to fill it. Tote-A-Ton comes in black with red, purple, red and turquoise. There isn’t any difference in size between the colors, it just depends on how sassy you want to feel that day. The biggest complaint that Tote-A-Ton seems to “carry” around with it is that when it’s full, it’s pretty heavy (in some cases 50lbs heavy)! Bear this in mind if you’re short or have a slight build like me because if you intend to fill this bag to the rafters (like I would), you will need some help carrying it. This is especially true if you’re flying somewhere although there are plenty of carts to make use of prior to checking the bag. It’s just getting it from airport to transport! That being said, it’s the perfect bag for road trips or for storing items you just can’t bring yourself to part with. 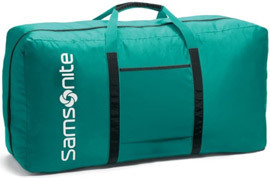 For something that can hold a whole host of items of all sizes, I think the Samsonite Tote-A-Ton 33-Inch Duffle Luggage could be the perfect solution to our yearly trip down south with ALL THE PRESENTS for what seems like a small army. There is more than enough room to make transporting them much easier than our current tactic of stacking them and hoping that they don’t get dropped. I’m not sure I would want to trek across an airport with one of these beasts in tow, but that doesn’t mean it isn’t just as useful for a different purpose. Car trips and present hauling would probably greatly benefit from this $25 investment.